Keep Focused is a simple application that will help you to register each task that you carry out during a 25-minute period. 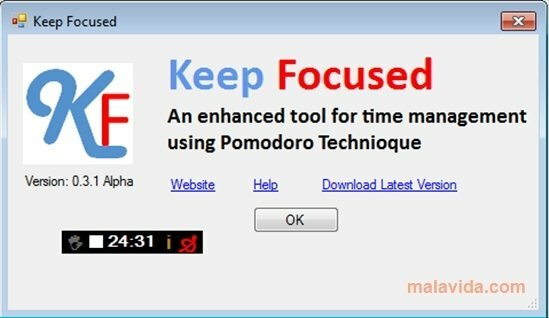 It is a simple tool that will allow you to fulfill the Pomodoro time management technique. This method consists in managing your work time by dividing it into 25-minute periods. After that amount of time you have to rest for 5 minutes. 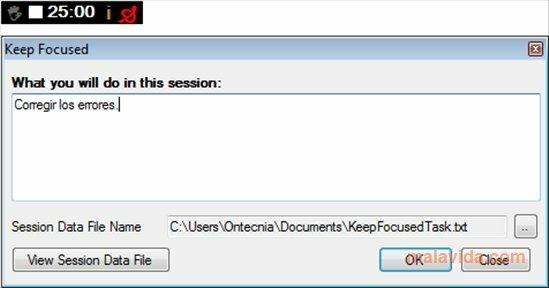 When you launch Keep Focused, a dialog box will ask you what task you are going to carry out. All the tasks that you register will be stored in a text document so that you can control everything that you have done and the time that you have spent ono each thing. 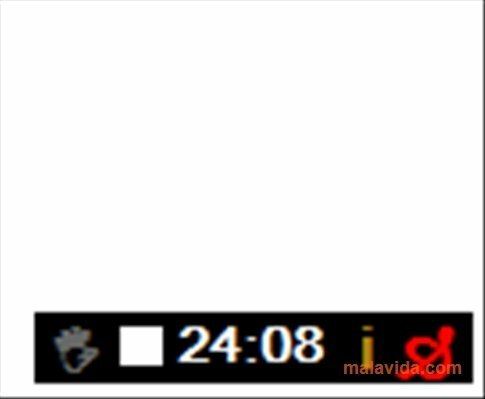 When you accept that box, a small stopwatch will open on your desktop with a 25-minute marker. Once that time has gone by, you will have to rest for 5 minutes before moving on the next task or continuing with what you were doing. Keep Focused allows you to pause the countdown or to resume it whenever you want. If you follow that method, you will be able to increase your work productivity and you will manage higher concentration and a better performance.